Power & Motoryacht's boat test of the Regulator 34 Center Console. The Regulator 34 looks and feels like she’s ready to take on the tournament fleet. “If I get a charter boat when I’m older, I’m gonna get a big one.” So said Darren Gibbs, age 10, as he and his mother watched the boats of Pirate’s Cove Billfish Tournament return from the fishing grounds. That towheaded Tarheel had big ideas, and why not? He was looking upon some of the finest specimens ever to slip down the ways, including offerings from Spencer, Ricky Scarborough, Bayliss Boatworks, Paul Mann, Hatteras, and the list goes on. One after another, 55-, 65-, 70-foot convertibles offered their heartbreaking broken sheerlines and wave-breaking flares. Young Darren, his mother, and I watched the big ones glide through the harbor and effortlessly back down into slips with crowds in the cockpits—it was a tournament after all. And I can’t deny it—this 41-year-old boy felt the same twinge. But I didn’t come all the way to Manteo, North Carolina, to gawk. 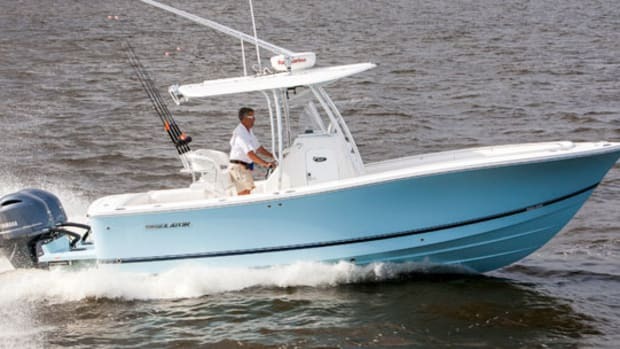 I was here to test another Carolina build—the Regulator 34 Center Console. Regulator Marine was introducing this gleaming red boat to the tournament crowd with some help from Bluewater Yacht Sales, and her dance card was filling up fast for the fall. So I made my way to Manteo to catch a glimpse and see what she could do. 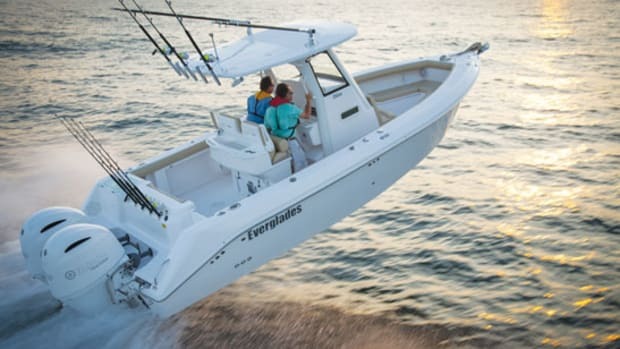 Regulator Marine has been building no-nonsense boats in Edenton, North Carolina, since 1988, and the company has grown its line to include center consoles ranging from 23 feet to 34 feet. 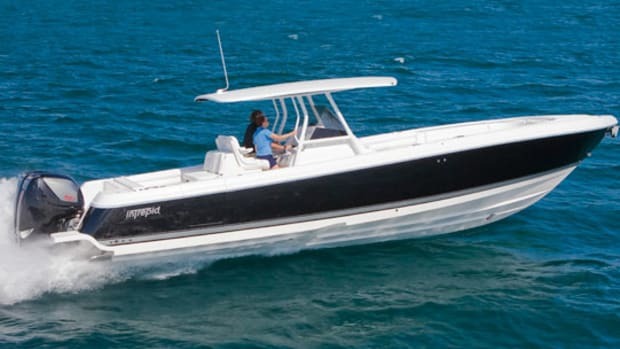 The company dabbled in express boats over the years, but the range topped out with the 34 Starboard Seater (SS), which is basically a center console that offers bow access only on the port side, since the bow seat wraps around on the starboard side. 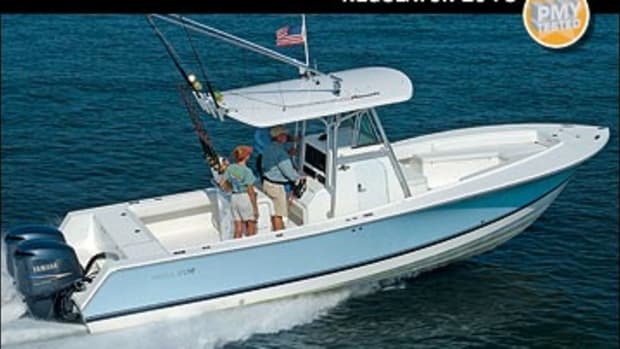 The 34 center console uses the same hull mold as that boat, but with a true, unencumbered center console with 360-degree fishing access. 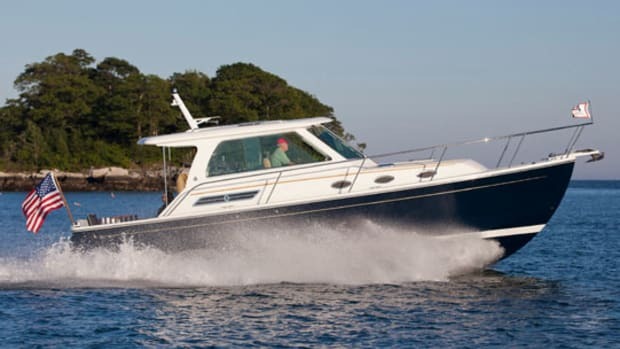 Regulator once offered their center consoles in two deck configurations: classic, with an open foredeck, and forward seating (FS), which offers molded-in benches around the bow. The classic deck has been shelved for the time being. “We listen to what the customer wants,” says Al Partin, Regulator’s customer service manager. “Everyone wanted a true center console on the 34, so that’s what we build. 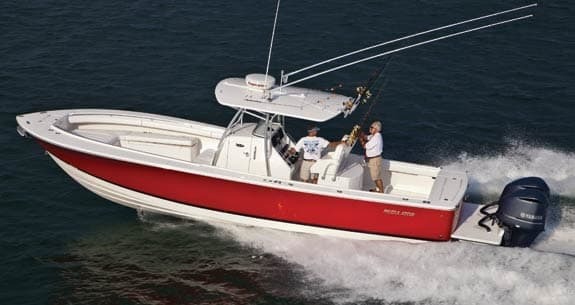 We still offer the starboard seater because there is interest for that model, too.” That same process is what has kept the 34 SS in production for 54 hulls—buyers, including some anglers, were surprised at how much they like the 34 SS after thinking they wanted a true center console. The way these Regulators run is no small part of their appeal. 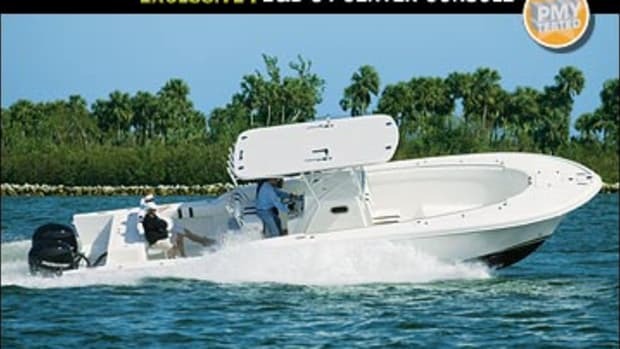 The smooth ride is a result of a combination of hull shape and rugged hand-laid construction, including a foam-cored internal grillage frame that supports the hull and deck and provides both fore-and-aft and transverse stiffness. The running surface, designed by naval architect Lou Codega, is the same on all Regulators, a modified-V with 24 degrees of transom deadrise. We had very calm conditions on our test, but a couple of wakes from returning sportfishing boats showed us what’s what. The forefoot cuts through the waves and knocks down the spray, thanks to a chine that carries forward nearly to the bow. I could feel the energy of the wake dissipate as the hull rose and settled, then rose slightly and settled again. It’s a predictable motion, and after the second one, I didn’t even look for a grabrail. 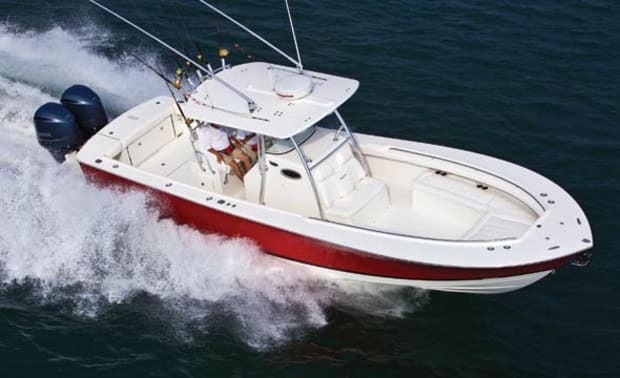 The 34 is powered by a pair of 350-horsepower Yamaha V-8 outboards mounted on an Armstrong bracket. Regulator has used these brackets since their first boat, and I must admit I’ve never understood it: You design a hull to be powered by outboards and yet don’t include a way to mount the engines? But I get it now. The bracket does a few things for you. First it gives you a complete, finished hull from front to back—that full, high transom gives you confidence when things get snotty. Second, those outboards get plenty of room side to side, which they need because they seem to be getting wider all the time. Partin told me this bracket was designed specifically for the Yamaha 350s, and it goes a long way toward managing the outboard rigging—hoses pass into the bracket rather than the transom. The third advantage is that it gives you cleaner water at the props, which lets those engines work more efficiently both in straight-line running and through turns. 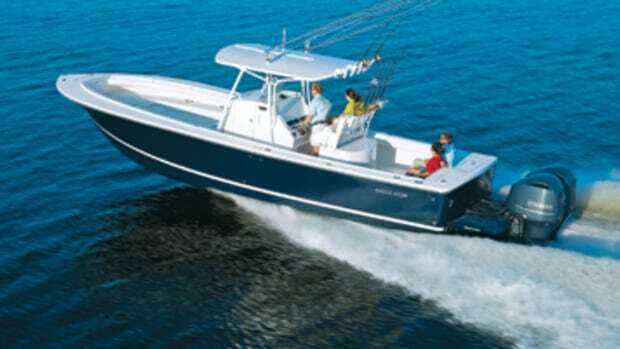 Because of the bracket, this 33-foot 10-inch hull has an LOA of 38 feet 6 inches, and it can do what it was designed to do, and the outboards can too. As I initially approached it on the dock, the 34 looked like a very high-sided center console, but that feeling melted away as I put her through her paces. She handled the minimal chop with ease and I looked at the conditions and bit my tongue rather than asking why exactly we weren’t fishing? 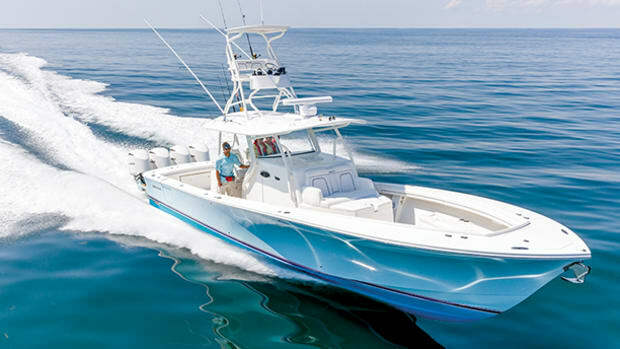 It would have really been something to head out to the grounds, deploy the optional 16-foot Lee Sidewinder telescoping outriggers and show those big convertibles lumbering back and forth that you don’t need to bring a living room with a leather sofa and a color TV to have a great day offshore. That’s where Regulator really threw me a curve. While it may not be a living room, there’s a head compartment beneath the console that gives you standup space, plenty of room to maneuver, a service panel for the helm dashboard, and, get this, a double berth stretching forward beneath the foredeck. Accessed from a portside door, the compartment has the coolest single-strut access stairs, with rounded steps large enough to make you feel comfortable going below in shifty seas, but not too large to intrude on the space. It’s a place to get out of the sun and lay your head if need be, and it’s even air conditioned. The boat has a great roomy cockpit, with in-deck stowage that was just the right depth: There was plenty of space but nothing would be out of reach. Another hatch farther aft offered access to pumps, transducers, and equipment. The aft seat folds flat against the transom, truly out of the way, and when it’s deployed it’s a real, usable seat—I sat back for part of the ride and stretched out. The transom has a walk-through tuna door out to the bracket, and running my fingers along the finished edge of both the door itself and the transom framing it, you get a feel for the craftsmanship that’s going into this boat. It stands up to close inspection. The transom also has a full-length fishbox. The standard leaning post offers tackle stowage, a finely finished livewell, and a sink and cutting board. A pair of helm seats converts into leaning bolsters by folding up the forward edge of the seat cushion. While I generally like to stand on a boat, this seat cushion, when folded down, made me think. Working in tandem with a fold-down footrest on the leaning post, it provided a comfortable perch where I didn’t feel my legs would go numb. The optional T-top is a sight to behold, largely because of the “surfboard edge” finish—you just have to run your hand over it. The top is a solid addition and comes with a molded-in electronics box, fore and aft LED lights, and prewelded outrigger bases. An optional three-sided enclosure runs from the top to the covering boards on either side, lending easy access to the head compartment even with the enclosure in place. We didn’t need it on the day we were out. Driving this boat, particularly on such a pretty day, made me feel as though a world of possibilities was opening up before us. As we motored out of the channel, Partin pointed out the Oregon Inlet Fishing Center. I couldn’t help but think he wanted to wet a line as well. That console was just the right size. I felt it blocked the wind with its curving windshield, yet let the breeze through to keep us cool. 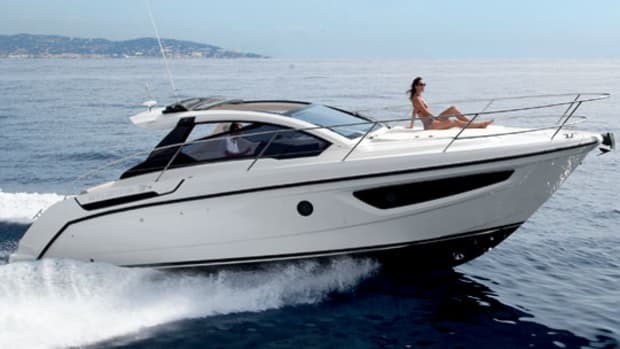 The boat was equipped with an updated Raymarine electronics package, including radar. And once we’d really seen what she could do during our test—she topped out at nearly 46 knots—we’d have no trouble catching up to the fleet. I waited for Partin to say the word. At the very least we could anchor out and enjoy some lunch on the foredeck, replete with recessed grabrails and cushioned seating. Big stowage boxes beneath those benches would have held rods to put out a marlin-worthy spread, were there any justice in the world. But we had to get back: I for the tournament weigh-in, and the Regulator to her prominent location on the trailer. Back at the marina, we said our goodbyes. As Partin cast off lines to head for the launch ramp, I wandered up the dock to find some shade from the afternoon North Carolina sun. But I stopped and turned to watch that Regulator slip away from the dock at idle. Maybe I did come all this way to gawk after all. 145 gal. fuel, no water, 3 persons, 40 lb. gear.